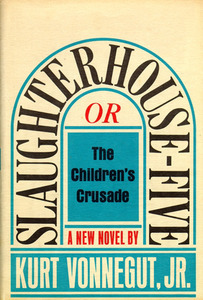 Kurt Vonnegut Jr. Slaughterhouse Five or the Children's Crusade. New York: Delacorte Press, 1969. 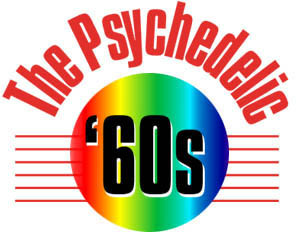 THE UPHEAVALS THAT defined the sixties brought about a mainstream acceptance of many writers who had been considered minor or in some cases underground. Kurt Vonnegut, whose first novel, Player Piano, was published in 1952, had a small, but fiercely loyal following, but the literary establishment was not willing to give critical recognition to writers of science fiction. The shift in literary tastes that came in the sixties brought Vonnegut to the forefront with novels such as Cat's Cradle and God Bless You Mr. Rosewater, and established him as one of the most popular among readers seeking alternative literary heroes. Slaughterhouse Five, like Catch-22, was written about World War II, but had an enormous impact on galvanizing anti-Vietnam War sentiments. Vonnegut lived through the allied bombing of Dresden in 1945, and Slaughterhouse Five recounts his experiences as a prisoner of war before, during, and after the bombing. IN 1950, GWENDOLYN Brooks became the first African American writer to win the Pulitzer Prize. She was a successful poet during the fifties, particularly with the publication of A Street in Bronzeville and Annie Allen, and continued to be so into the sixties when her work began to reflect the politicized discontent of a minority people and the problems of color and justice. Riot was written in response to the disturbances in Chicago after the assassination of Dr. Martin Luther King Jr. in 1968. 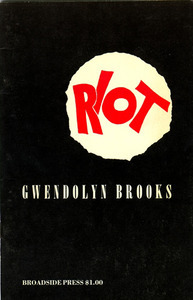 Ms. Brooks was accused of celebrating violence, but she preferred to think of Riot as a contribution to a "healthy rebellion." 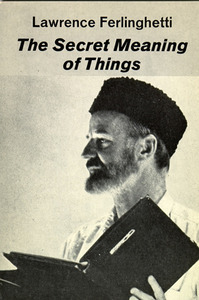 Lawrence Ferlinghetti. The Secret Meaning of Things. New York: New Directions Books, 1969. LIKE MANY OF the important Beat writers, Lawrence Ferlinghetti continued writing throughout the sixties and beyond. He was widely read among the new hippies as his poetry came to reflect the changing times. In this late sixties collection, Ferlinghetti writes 'Assassination Raga' about the assassination of Robert Kennedy, 'Bickford's Buddha' about "observation fever," attempting to attain a Buddhist's perfect vision, and 'Through the Looking Glass' about ingesting LSD on a flight to India. 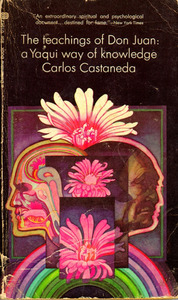 Carlos Castaneda. The Teachings of Don Juan: a Yaqui Way of Knowledge. WHILE A GRADUATE student in anthropology at UCLA, Carlos Castaneda went to Mexico to learn about peyote and medicinal herbs used by the local Indians. There he met Don Juan, a Yaqui Indian brujo, or sorcerer, who took Castaneda as an apprentice and initiated him into the esoteric uses of hallucinogenic plants. Using peyote, jimson weed, and other natural hallucinogens, and receiving instruction from Don Juan, Castaneda worked for five years to become himself a 'Yaqui' or man of knowledge. In an age when experimentation with hallucinogenic substances was rampant, the so-called 'Don Juan' books seemed to give legitimacy to drug experimentation, and the books were widely read and discussed­paperback copies could be found in most dorm rooms, communes, and hippie dwellings. LeRoi Jones. 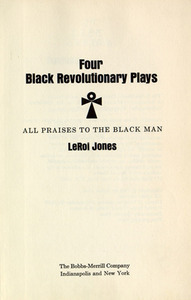 Four Black Revolutionary Plays. Indianapolis and New York: The Bobbs-Merrill Company, 1969. BY 1967, JONES had changed his name to Amiri Baraka and moved to Harlem where he founded the Black Arts Repertory/School. Deeply affected by the assassination of Malcolm X, Baraka became a leader in the Black Nationalist Movement, estranged himself from his white friends from the Beat era, and separated from his wife and children. During the sixties, Amiri Baraka published a number of influential works espousing the ideals of black separatism, and it was not until 1974 that he came to see black nationalism as a destructive form of racism. In the seventies and eighties Baraka taught at a number of Universities including Yale, Rutgers, San Francisco State, and the New School for Social Research. He continues to lead an active life in literature and politics. Gary Snyder. Sours of the Hills. WHEN GARY SNYDER returned from Japan, where he had studied Zen Buddhism for twelve years, he found that his popularity and influence had not waned. His emphasis on spiritual quietude, and his advocacy of a simple life lived in the wilds of nature, resonated among those who were dropping out of society to seek a simpler existence. He was often in attendance at the various rallies with Allen Ginsberg, Timothy Leary, and Alan Watts. 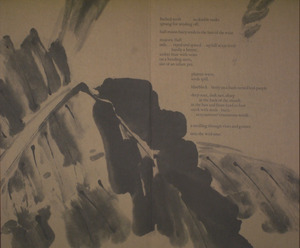 People seeking inspiration in the wilds, starting communes, or living in teepees in the mountains, looked to Snyder's poetry for inspiration and guidance. Unlike most of his peers who eventually dropped back into society, Gary Snyder still lives as he always did, high in the remote mountains of northern California. Rolling Stone Magazine, October 1970. San Francisco: Straight Arrow Publishers. JANN WENNER WAS a student in San Francisco when he founded Rolling Stone Magazine in 1967. Rolling Stone was at first a one page broadsheet that Wenner hawked from the back of his car, but it quickly grew into the biggest, most influential of all the rock magazines. Though Rolling Stone started out no differently than dozens of other city rock magazines, Wenner saw that the magazine could be a success on a national scale. 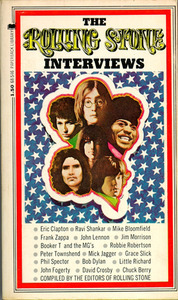 His aggressive hustling brought him the coveted interviews with many of the biggest stars in Rock and Roll music. Rolling Stone is still widely read by younger rock fans of today. 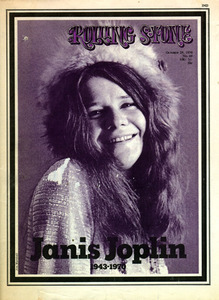 Shown is an issue from October 29, 1970, reporting on the then-recent death of Janis Joplin. New York: Paperback Library, 1971.